I get these emails all of the time, you probably do too. I can help your website reach the first page of Google, Guaranteed. Typically you are getting these emails the more visible your web presence becomes. What bugs me about them is that when it comes to SEO, ranking on the first page of Google is a term that sounds great to a business owner who may know very little about SEO. What ends up happening when SMB’s invest in these claims? Six months later they still don’t know much about SEO and are not getting any more traffic to their site than before. What I am dying to tell everyone is, ranking on the first page is all relative. Which ONE keyword are you planning to rank me for? My point is, there are thousands of keywords and variations of keywords that a consumer could type in to the google search bar to get to your website. You need a REAL strategy to rank for 20/30/40 if the top search terms for your industry and local area. 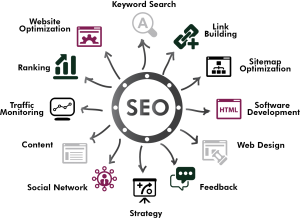 This is a process of keyword research, authentic inbound link building, tweaking content on your site as well as back end site structure, blogging, social sharing and much more. In SEO, you get what you pay for most of the time. And I always say, if you can find it cheaper, we will gladly fix it for you. Now that doesn’t mean SEO has to be expensive, but please use caution when choosing an SEO vendor to work with. Last, I will leave you with one of my favorite graphics that explains what a strong SEO strategy entails. Feel free to send in your comments or questions.